Mahler’s Symphony No. 6: “A Hero’s Life”? Who is the “hero” in Mahler’s Symphony No. 6? Mahler composed his sixth symphony over the summers of 1903 and 1904. This was a very fulfilling time. His career was increasingly successful. He had married in 1902 and now had a daughter, with another on the way (the second being born just before completion of the sixth). Aspects of his family life seem woven into the piece. According to Alma, Mahler consciously represented her and their playful children in the first movement and scherzo, respectively[i]. Yet it is one of Mahler’s most emotionally overwhelming works, with the “hero” of the symphony suffering three blows of fate and utterly destroyed by the end. It is his only symphony to end in complete pessimism. He referred to it as his “tragic” symphony. It is tempting to interpret this symphony as Mahler’s personal expression of anxiety, that something was going to happen to him. Like a superstition, when things go “too” well; the Fates or the gods, as in Greek tragedy, punish the hero for his good fortune, or some flaw. Why else a tragic symphony (as well as the tragic Kindertotenlieder) at this time in his life? And Mahler was superstitious. Or could it be flaws in his personal life were the source of anxiety? But in his art, Mahler dealt with human universals and post-romantic themes. As musicologist and philosopher Theodore Adorno wrote, he was “not content with first persons”. To Mahler, we’re all the hero in the narrative of our lives. The fates of all humans contain struggle and calamity. 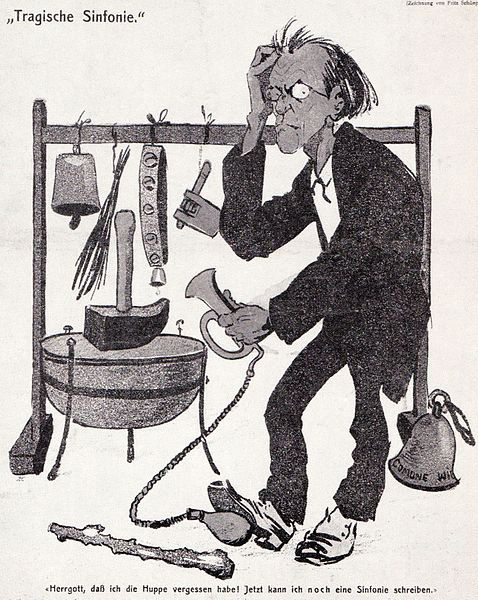 Mahler shared that fate, but as artist he wanted to illustrate it and comment upon it. Why Mahler chose to create his musical “essay” on fate at a relatively satisfying time in his life is open to speculation. 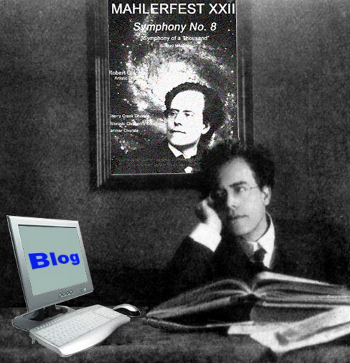 You can be part of the experience – The Colorado MahlerFest will perform Mahler’s Sixth Symphony May 17 and May 18, at Macky Auditorium in Boulder, CO.
[i] At the time Mahler composed what would become the third movement scherzo, the Mahlers had only one child. This entry was posted in MahlerFest, Ron Nadel and tagged Classical music, Colorado MahlerFest, Gustav Mahler, Mahler, Mahler Symphony No. 6, mahler's sixth, Ron Nadel. Bookmark the permalink.